Sculpture in the Parklands at Lough Boora, Co Offaly is an intriguing place. It is a sculpture park in a partially-managed landscape which, following decades of commercial exploitation through peat extraction, is rapidly returning to a semi-wilderness. 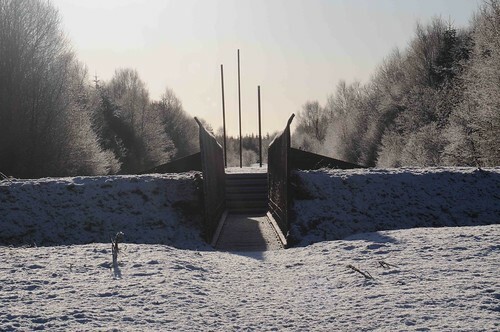 It is unique in Ireland, if not elsewhere, in being the only sculpture park to be located in a cutaway bog landscape; a remarkable place where the urgencies of nature and of human activity are in constant counterpoise. I was invited to be an artist-in-residence at Sculpture in the Parklands 2009 and I created a work there in response to the bogland landscape and the industrial heritage of Bord na Mona’s Boora workshops. My work, “Passage”, is a contemplative, perhaps even sombre, piece. I was less interested in creating an object where the surroundings become a stage or backdrop for the work than having them be the means by and through which it is realized. Working in bogland was not new to me having created a series of ephemeral works on the raised bogs of Achill Island during a residency at the Heinrich Böll cottage a decade ago. But this time I wanted to explore beneath the surface, cutting into the memory bed, so that the experience of engagement with the work might also feel like an engagement with time and the processes of material decay. I wanted to create a work which might serve as a visual and physical passage into an experience of landscape, one within which the passage through dark matter into light can be physically felt, one better sensed from within than from without. 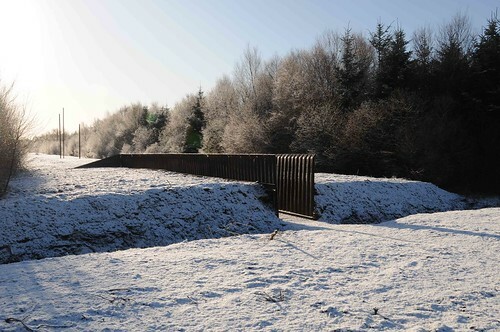 “Passage” comprises a sixty-foot long trench cut into a raised turf bank. The turf bank, bare on its surface, is itself a form of passage, lined on both sides with trees and leading deep into the woodland. Having made the cut -(the deep passes of the hi-mac’s blade left patches of luminous red glowing in the black, buttery peat; the wood of ancient alders exposed after millennia to the air ) – its floor was lined with cloth and stone and a rail trackway laid upon it. 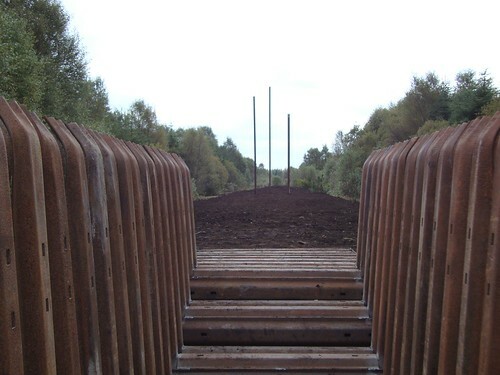 This is the same rail trackway as still used to transfer milled peat from bog to power station. 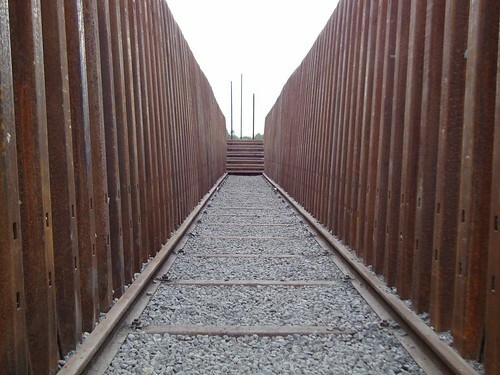 The sleepers Bord na Mona uses are metal, the material of power, and we also employed them, with their rusted surfaces, to line each side of the trench. They were further used to create a series of steps at the end of the cut which carry one on to the top of the turf bank. Sixty foot further on from the top of the steps stand three vertical rails of different heights, Beyond them, the trail into the forest. People have described the sense of physical compression they experience within the passage, how they feel ineluctably pulled along its length, eyes down on the track-way until, rising up onto the turf bank they are drawn skyward by the rails and trees. 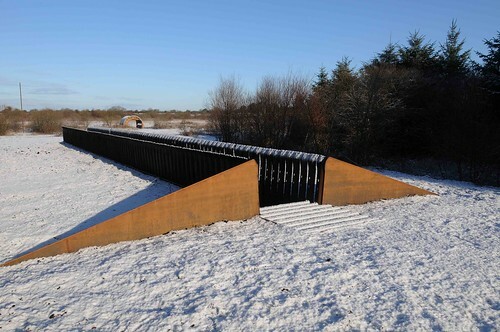 For Sculpture in the Parklands 2009 commission, Alan Counihan created Passage. A poetic landscape specific intervention, Passage is all about the passage of time, our memory of place, and the site sensitive moment in time. Time’s arrows leave us with a physical place and the passage is through the peat land. As a passage Counihan’s work is time-bound yet exists as a passage through the matter of the landscape. We move through sharp contrasts of steel and black peat as if this were a tunnel through time, only to discover an expanding landscape beyond as we emerge where three totemic vertical elements stand. The resonance of the three elements reifies our sense of this living, ever changing, natural scene. Passage in a strange way is reminiscent of German artist Martin Kippenberger’s METRO-Net subway entrances set in Dawson City Yukon (1995), and connecting to an island in Greece where a similar subway entrance was built, to thus form conceptual links to varying landscape sites. The difference is that Counihan’s in-situ art piece is minimal in its editing down of materials to the essential. Like a trench, that passes into a landscape of light, Passage references the material landscape, and its material ecology, something that has shaped our economies, our ways of living in relation to nature, and even the way we communicate in a very specific way, whatever bio-region of the world we live in. The narrow gauge rail tracks on the floor/ground of this “earth bridge” and the sleepers, recycle the industrial remnants and traces that link Bord na Mona to the land. The three rails point to the sky and a trail and path lead backwards into a backdrop of nature. Time, Art, Land; Ireland’s Sculpture in the Parklands. John k. Grande. Public Art Ecology Magazine, Shanghai, China. 2011.